If you are getting random occurrence of the error message that reads “Save a Theme: Windows can’t find one of the files in this theme. 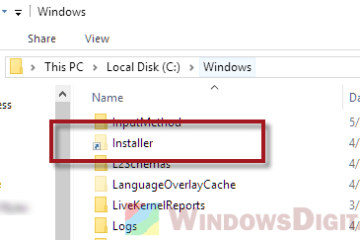 Do you still want to save the theme” in Windows 10, here’s what this error is about and how to get rid of it. As its name suggests, Windows can’t find one of the files in this theme that you’re currently using. It will throw you the error message when Windows detects one or more elements the theme relies to are missing or don’t exist. For example, one of the background wallpapers, icons or sound files is missing from the theme could trigger the Windows can’t find one of the files in this theme warning occasionally in Windows 10. Until the missing file is found again or replaced, the error will continue to show up whenever the Windows theme request for the missing element. If you have hundreds of backgrounds and wallpapers in the theme you’re using, and if there is any chance that these wallpapers have been moved to a different folder or something similar, try to locate and move the wallpapers back to where it should be, if you can remember. If you will, try to switch to a different Windows 10 theme and see if the error message will still show up. Try to re-download the theme if they are from somewhere else and see if the problem persists. If it’s an official Windows 10 theme or a custom theme customized by you, try the next solution. The best way to get rid of the error is by turning off the theme synchronization. Windows show the error message whenever it sync and an element requested doesn’t exist. 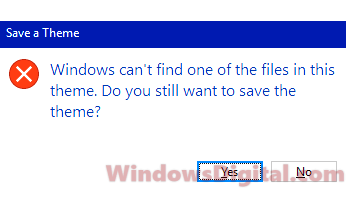 By turning off theme sync in Windows 10, Windows will stop syncing the theme, thus, stop sending the Windows can’t find one of the files in this theme error message. 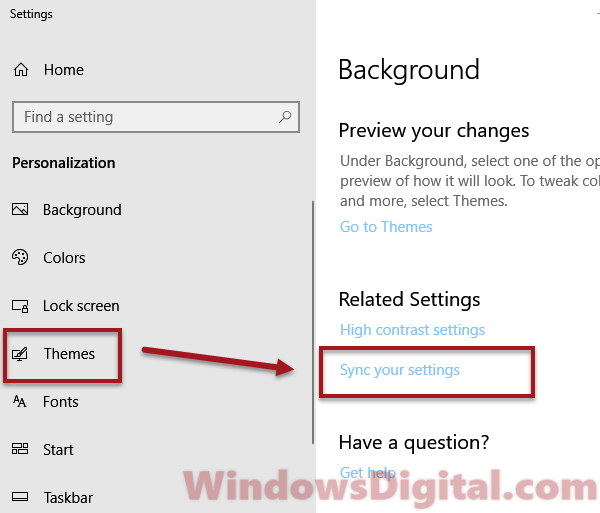 To turn off theme synchronization, follow the steps below. Right-click anywhere on your Windows 10 desktop. From the left pane, select Themes. Under Related Settings, click on Sync your settings. 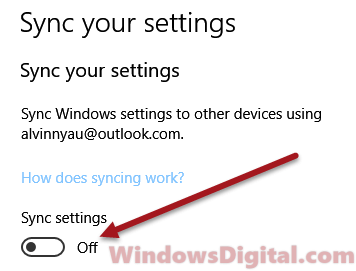 Toggle off Sync settings to disable it. This should stop Windows from prompting you the Windows can’t find one of the files in this theme error message again. At the same time, you will also lose the ability to sync the themes and its settings across your devices with your Microsoft account. If you don’t mind losing the theme sync feature, just turn it off. Description for sharing: If you keep getting the save a theme "Windows can't find one of the files in this theme. Do you still want to save the theme" error message occasionally in Windows 10, here's a workaround to get rid of it. Unfortunately, this does not work for me. Sync Settings has been disabled since the first day I installed Windows 10, and it’s still off. But it doesn’t matter, as Windows 10 insists on trying to sync the theme anyway.